Zachariah A. Levitan, Recipient of the 2018 Lamb Prize is shown here after the President’s Reception. With him are Dr. Donna Lybecker of Idaho State University (Chair of the Lamb Prize Selection Committee) and Dr. Berton Lee Lamb of Negotiation Guidance Associates (Past President of the Western Social Science Association [WSSA] and Chair of the Lamb Prize Steering Committee). Zachariah Levitan graduated in 2018 from the Rockefeller College of Public Affairs and Policy, University at Albany SUNY. 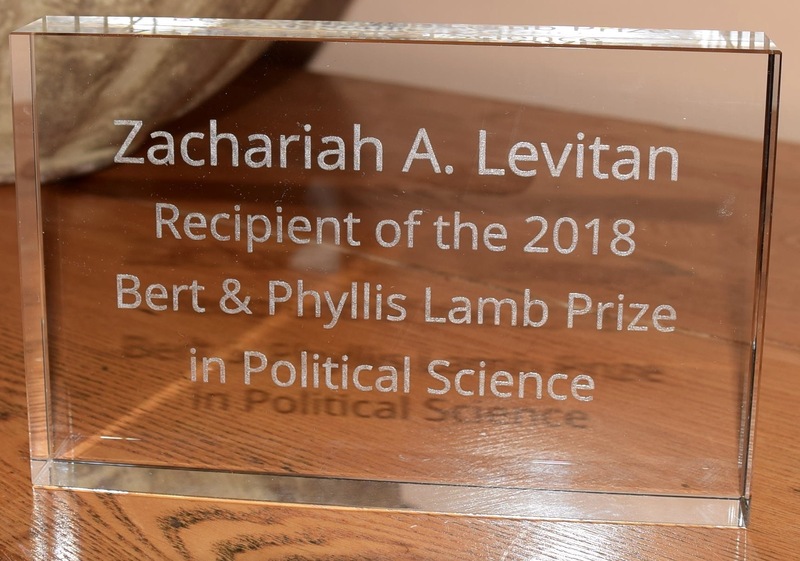 The Bert & Phyllis Lamb Prize in Political Science includes a $1,000 cash award, travel expenses up to $1,000 to attend the annual meeting of the WSSA, publication of the winning paper on the Lamb Prize website, one-year membership in the WSSA with subscription to the Social Science Journal, and a plaque. The Western Social Science Association is committed to multi-disciplinary and interdisciplinary scholarship, service and collegiality. There are 33 “sections” within the WSSA, ranging from African-American Studies to Women’s and Gender Studies. Although the Lamb Prize is most closely affiliated with the Political Science, Public Administration, and Environmental Policy and Natural Resource Management sections, many of the other sections incorporate areas of study related to Political Science. As part of the 2018 conference, the Lamb Prize hosted a roundtable panel within the Political Science section focusing on the theme of innovation. Mr. Levitan presented his paper during that discussion. The annual conference of the WSSA typically draws scholars from throughout the United States, Mexico, Canada, and many other countries. This entry was posted in Award, Recipients, Winning Submissions and tagged Award, Recipient, Successful Applicant, Winner. Bookmark the permalink.